(Newser) – The Disneyfication of Cold War landmarks in Berlin has irked people with bad memories of East Germany, the Independent reports. 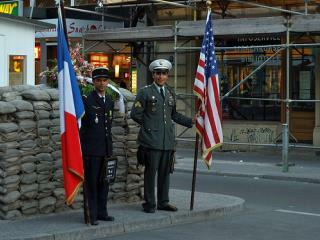 Critics, including former Allied officers and those who suffered under oppressive rule, argue that the atmosphere around places like Checkpoint Charlie—where actors in military uniforms hustle tourists for coins and "Snackpoint Charlie" sells burgers—disrespects the memory of those who died there fleeing Communist rule. We tend to reduce everything to a theme park version of its true self in order to repackage and sell it to the masses as cheap (though not inexpensive) entertainment. What's next, Disney Auschwitz?